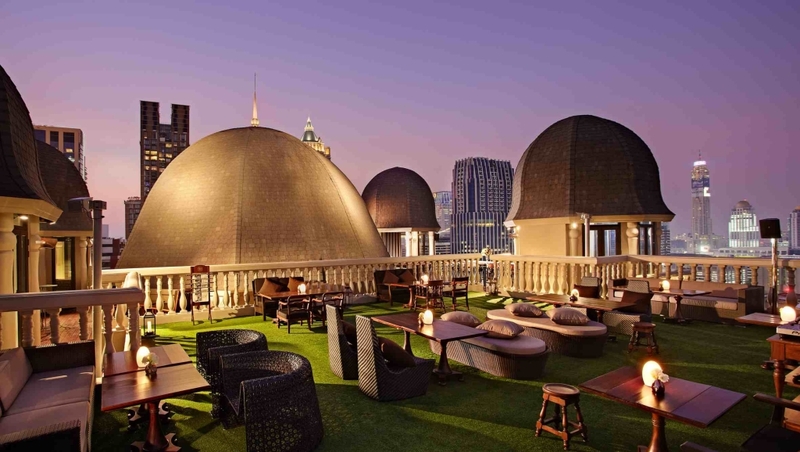 When it gets hot and crowded in Bangkok’s city streets, there’s no better place to escape than one of the city’s spectacular rooftop bars to enjoy a cocktail or two to cool off as the sun goes down. 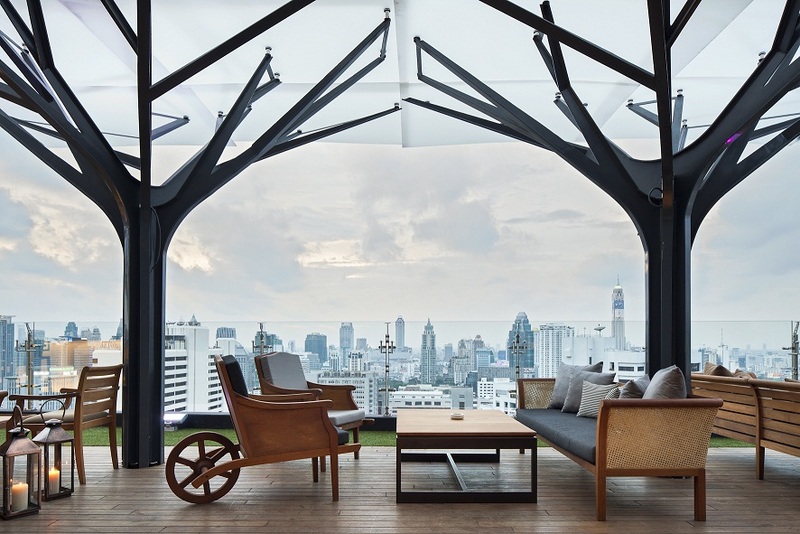 Bangkok has one of the most spectacular skylines in the world, so it’s only fair that it has a plethora of trendy sky bars to ogle at the view from above. Whether you’re looking for a bird’s eye view over the city, a sumptuous cocktail or just a comfy couch to rest your weary legs, here are some of my favourite bars I visited on my recent trip. Be warned that some of these rooftop bars have a very strict dress policy, especially for men. Even in the heat of summer, be prepared to leave the shorts and flip-flops at home. Perched sky-high at 61 floors up, the Moon Bar at the Banyan Tree Hotel is a force to be reckoned with in Bangkok’s cocktail scene. The design has been brilliantly executed, its odd elongated shape giving it a spaceship like feel which adds to the experience of being in the clouds. This bar gets packed, so be sure to come early to nab the best seat, while feasting your eyes upon Bangkok’s glittering skyline. You can’t go past the Vertigo Sunset cocktail, a melody of pineapple, cranberry and lime juices blended with just the right amount of Malibu. For the ultimate alfresco dining experience, cross the open air bridge to Vertigo Restaurant. 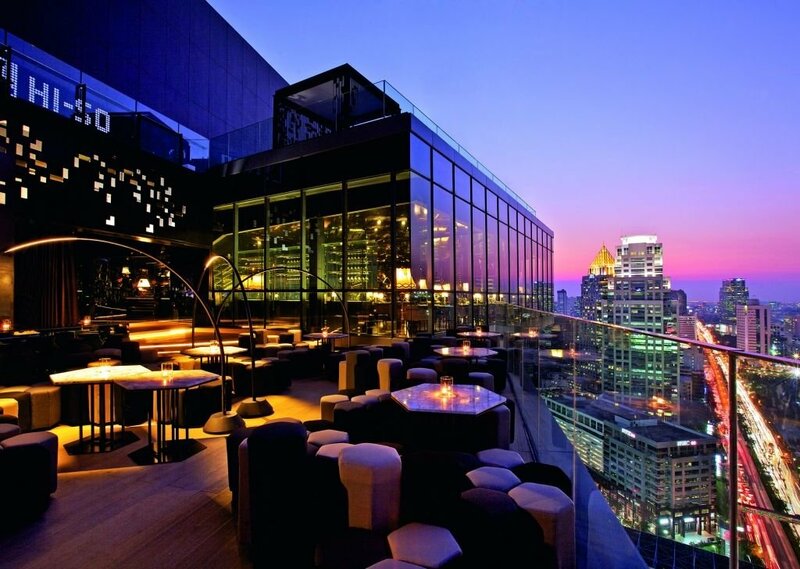 Located on the 24th and 25th floors of Hotel Muse, the Speakeasy bar is one of Bangkok’s most impressive rooftop venues. Boasting stunning views and sumptuous cocktails. the Speakeasy also offers a sophisticated French menu cuisine, created in the style of “The Forgotten French Dishes” inspired by Michelin Chef Jean Baptiste. 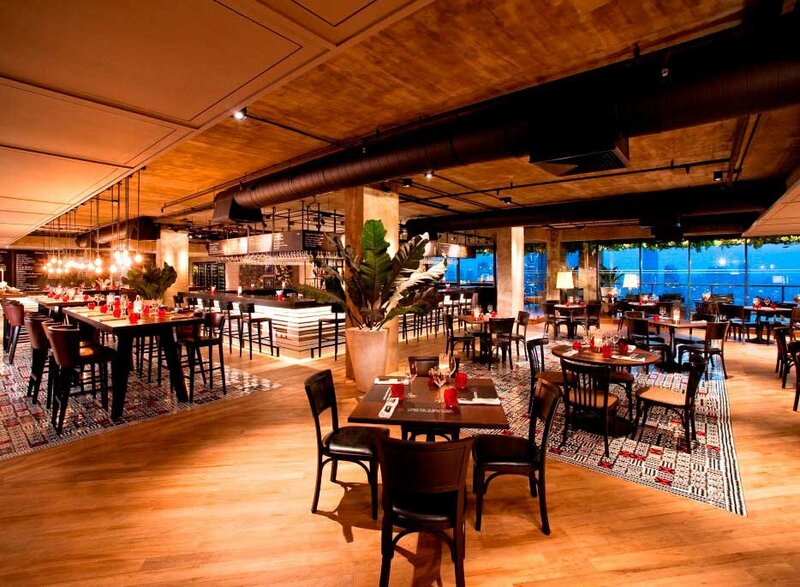 Expect prohibition style 1920s sophistication and elegance at this classy establishment. Choose from hand-crafted cocktails to suit the mood and tone of the era including the Manhattan, Old Fashioned, The Sidecar or a retro Mint Julep. Avoid ordering wine – I paid over $30 for a glass of Sauvignon Blanc. Park Society isn’t your average hotel rooftop bar. This bar, 29 stories in the sky, is a contemporary fit out where you’re imagination can run wild as you’re led through a futuristic maze of infinity mirrors and embossed stainless steel. Here you can enjoy a bird’s eye view over Lumpini Park and Bangkok’s stunning skyline. Towering above Park Society on the 30th floor is HI-SO, an exclusive rooftop terrace of private cabanas for dining or post-dinner drink. 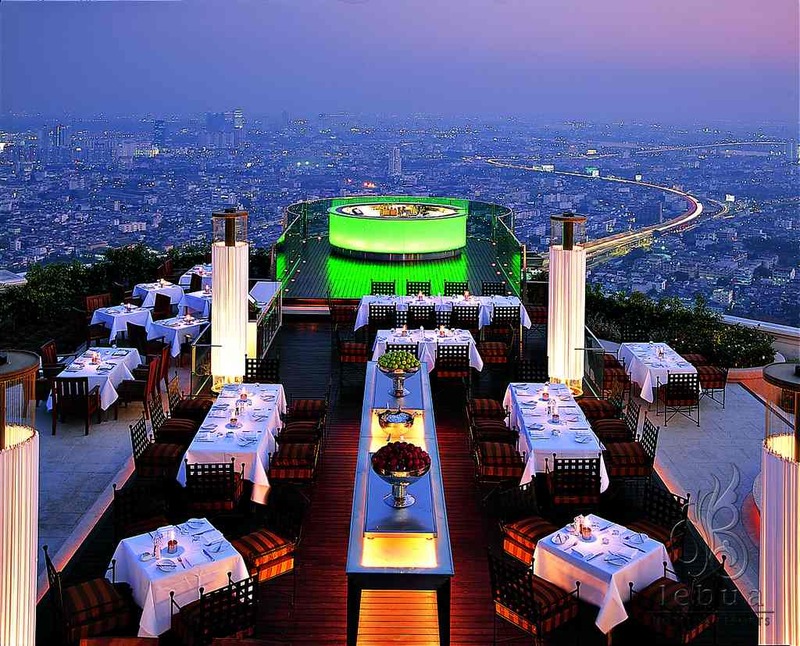 Widely regarded as Bangkok’s best rooftop bar and for its Hangover Part II fame, the Sky Bar can be a tad touristy but its 360 degree view is unbelievable. Suspended on a precipice over the city 820 feet in the air, Sky Bar is one of the highest rooftop bars in the world. Here you can expect innovative cocktails and creations like the interesting ‘Poptails’ where the mixologist brings together the cocktails and popsicle ice for the summer or the well-known Hangovertini. The glittering island Sky Bar is a great spot to soak up the glittering Bangkok skyline after a dinner at the award-winning Sirocco restaurant. Scarlett Wine Bar and Restaurant, located on the 37th floor of the Pullman Hotel G, is the perfect spot to chill out on the alfresco terrace with a glass of wine. With stunning views over the Chao Phraya River, Scarlett Bar’s open air balcony has a relaxed outdoor garden atmosphere which makes you feel immediately at home. If you’re feeling hungry, there’s also an award-winning restaurant inside serving traditional French cuisine, boasting floor to ceiling windows offering superb views. Bookings in advance are strongly recommended. 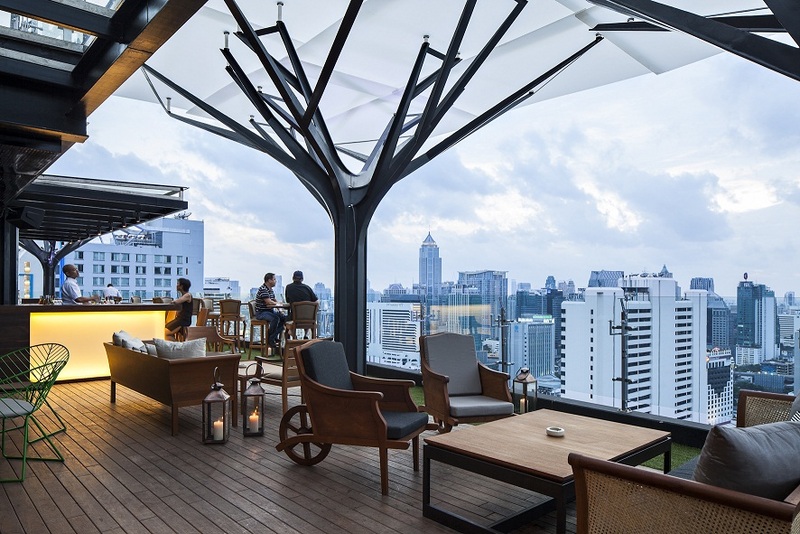 Nestled in the heart of Sukhumvit’s bustling Soi 11, Above Eleven is a rooftop bar and restaurant on the 33 rd floor of the Fraser Suites. It’s a design masterpiece, full of quirks and surprises like custom-designed structural trees, a maze in the entrance area and bathrooms offering a unique snapshot of Bangkok’s skyline. Above Eleven is also the first Peruvian Japanese restaurant in South East Asia in a rooftop venue inspired by the experience of being in one of the great urban parks of the world. I’ve been to a few of these and definitely Sky Bar is my favourite, you feel like you’re floating on air!